This stunning penthouse apartment located only 30 meters away from the beautiful Mediterranean Sea. It boasts fantastic views of the beach and overlooks the manicured palm-covered community gardens of Paseo del Mar. The Octogano beach club, tennis club and the Yacht club are located within walking distance. In addition, the Sotogrande Marina is less than 5 minutes away. The property itself is unique and spacious compared to most apartments found within the area. The living/dining room area has plenty of space and natural light, thanks to its top floor positioning. There is a fully equipped kitchen. Three bedrooms and two bathrooms. The terrace is the highlight to this property. 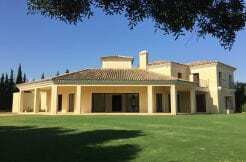 The ideal Sotogrande entertainment location, complete with ample space, beautiful views and even it’s own private pool. Additional Features: Hot & Cold AC, Parking Space and Furnished.